Editor’s Pick: Petite Celebrity Selena Gomez Petite Fashion Style! Yesterday, petite celebrity actress and singer 5’4″ Selena Gomez (age 19) stopped by the SiriusXM radio studio. Gomez petite fashion style was looking sharp in a Robert Rodriguez shirt and shorts by Nuj Novakhett. Classic houndstooth is officially making a comeback! The singer gave her retro houndstooth shorts a modern twist by styling them with killer boots and a sheer top. She is beautifully fresh faced and fashionably petite! What do you think about Gomez’s petite fashion style? Tell us below. Fashion Tips For Petite Women To in STYLE! 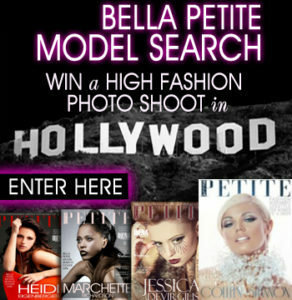 BELLA PETITE MAGAZINE Enter the Bella Petite Cover Girl and petite model editorial search! You must subscribe to enter the model search FREE. Actually, Selena Gomez is at least 5’5″; her legs are too long for a 5’4 body and she has much leaner figure if you compare her to Emma Watson. If she’s 5’4, then Emma Watson must be 5’3 tops.